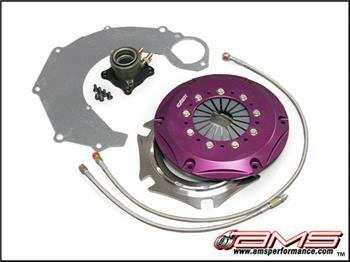 The AMS Performance / EXEDY Racing Push Style Conversion Kit is the solution for worry-free high RPM shifting. Only available through AMS, this clutch kit has been converted to a more reliable push style actuation utilizing a hydraulic throw out bearing. The same design that was developed and used on our World Record Holding Drag and Time Attack EVO VIII’s is now available to the public. This kit includes everything you need to convert your factory pull style Exedy clutch to a more effective and reliable push style clutch system.